April 6, 2016 – In April 1966, Lyndon Johnson was president of the United States, protests of the Vietnam War were growing, gas was priced at 32 cents per gallon, (You’re My) Soul and Inspiration was the No. 1 song on the Billboard charts, Bonanza was the No. 1 television show in the country and Ronald Reagan was successfully campaigning to become governor of California. Beyond Earth, the Russian spacecraft Luna 9 was on the surface of the moon, having soft landed in early February to send back the first photos from the lunar surface. Luna 10 was orbiting the moon, the first manmade craft to do so, while the United States was recovering from the Gemini 8 mission, which reached space but had to be aborted within hours because of a thruster malfunction. Meanwhile, a group of NASA engineers and operators were tucked away in a small concrete building on a misty spring morning in south Mississippi, working last-minute issues in their attempt to test the first Saturn V rocket stage at what later would become Stennis Space Center. They were entering their 25th consecutive hour as daylight began to grow on the morning of April 23. The countdown to test had begun the previous morning, with high-level visitors and television cameras on the scene to view and record the event. Finally, in the dawning gray of the day, a loudspeaker voice was heard, counting down at last into single digits – “5-4-3-2-1 .…” The bright red-and-orange flame came first, followed an instant later by the crack of ignition carried across the heavy air. “We have fire in the bucket!” someone announced. Fifteen seconds later, the flame and sound ended as planned. The first Saturn V rocket stage test was complete, and it’s hard to overestimate the impact of the event. The Space Age had arrived in south Mississippi, and the United States was headlong on its way to the moon. As soon as President John F. Kennedy challenged the United States to send humans to the moon by the end of the 1960s, there was no denying NASA would need a place to test the massive engines and rocket stages needed to meet that challenge. And, as soon as NASA announced plans to build such a test site in Hancock County, Mississippi, there was no denying the historical significance of the work that would be performed there. “I don’t know yet what method we will use to get to the moon, but I do know that we have to go through Mississippi to get there,” said Wernher von Braun, director of NASA’s Marshall Space Flight Center and architect of early U.S. space exploration efforts. “Go through Mississippi” is just what happened. Forty-three tests and 1,154 days after that first hot fire, Neil Armstrong, who had served as command pilot on that shortened Gemini 8 mission, would take “one giant leap for mankind” onto the surface of the moon. The rocket stages that carried him and 11 others to the lunar surface were all tested at Stennis. 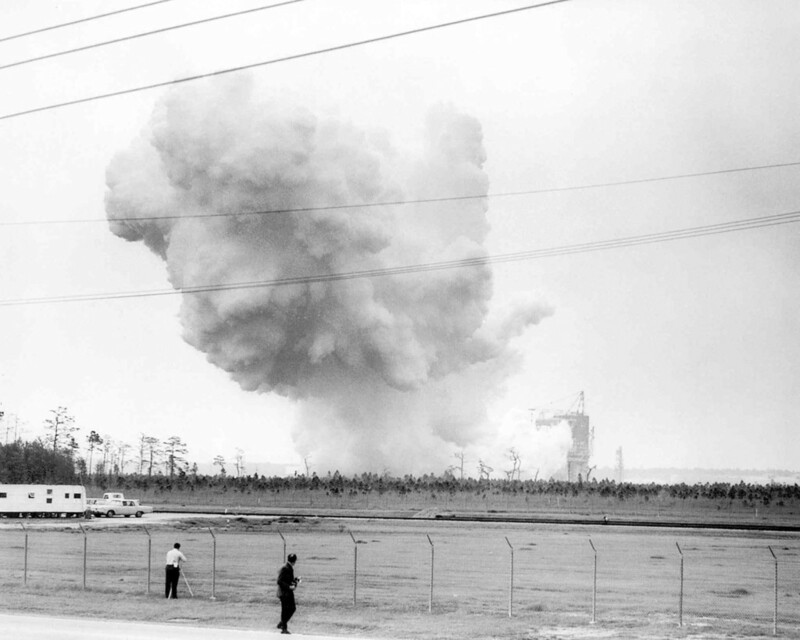 This year, Stennis marks the 50th anniversary of that misty April day in 1966 and five decades of testing excellence in support of America’s space program. In all those years, through both the Apollo and Space Shuttle Programs, no mission ever failed as a result of a malfunction in a Stennis-tested engine. Indeed, Stennis has grown into the largest rocket engine test site in the nation. It is recognized as a center of excellence for rocket engine testing. NASA’s rocket propulsion work across the agency is managed from the site. Every time the United States decides to send humans into space, its turns to Stennis. Even private companies are doing so, as Orbital ATK, SpaceX and Blue Origin all have partnered with NASA to test engines and components at Stennis. Well into its sixth decade of existence and beginning its sixth decade of engine testing, the site continues to prove its worth and value. Stennis employees of the time understood the significance of the testing conducted in those early years. The race to the moon depended on them. However, they probably could only guess at what lay ahead: the 135 space shuttle missions, the variety of commercial engine testing, the upcoming tests to support and enable American’s historic return to deep space. As it turns out, April 23, 1966, was more than just a historic moment in time. It was the opening chapter in a story that continues to grow.